1. Heat the oil in a pan, add the paprika and half the thyme. Sizzle for 1 minute, then tip in the peppers and tomatoes. Simmer for 5 minutes, stirring occasionally. Mash the peppers as they cook. 2. Grind 1 tbsp of the almonds with a pestle and mortar. Add to the pan with the beans and ½ a can of water. Nestle the fish in the beans, then add the remaining thyme. Season. 3. Cover and simmer for 10 minutes, then uncover and cook for 5 minutes more, until the fish is cooked through and the beans are saucy and rich. 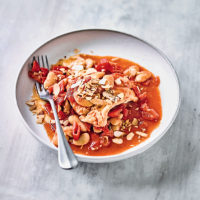 Finish with a drizzle of sherry vinegar and more flaked almonds. Serve with crusty bread.